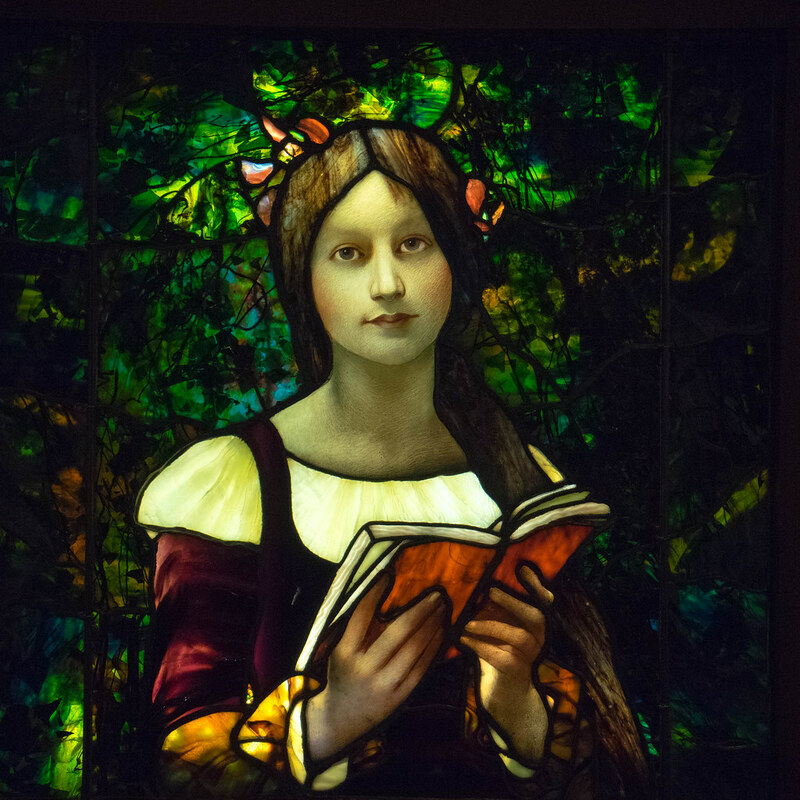 Jim and I snuck in a fast trip into the Cincinnati Museum of Art this past weekend. We were in a hurry because I had a wedding too shoot starting in the mid afternoon and there was a lot of windshield time in-between. The excuse was to see a collection of Samurai weapons and armor that was closing the next day. However, it was a side gallery that proved to be the highlight to the outing for me. 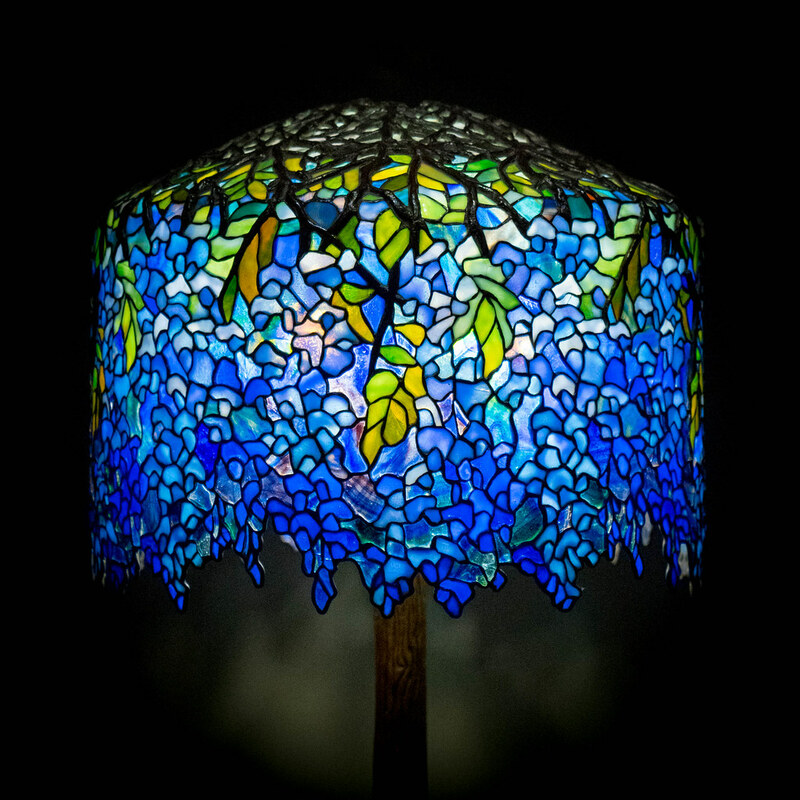 A collection of Tiffany windows and lamps. Gorgeous subtle colors. See for yourself. 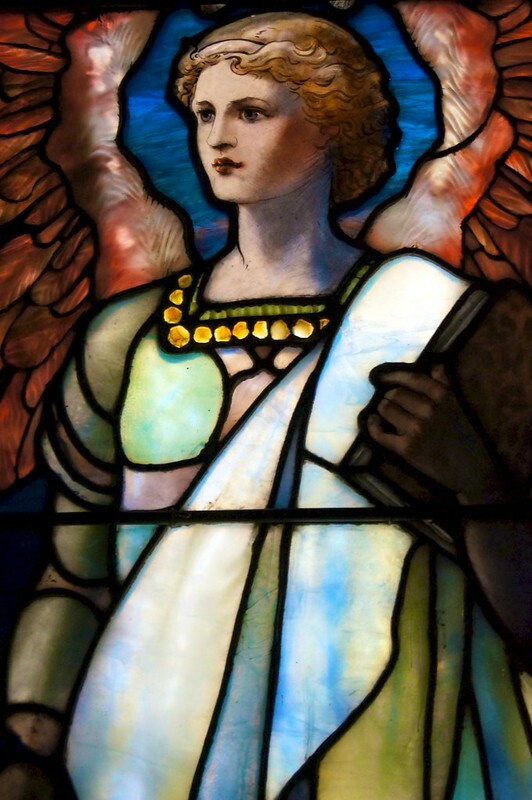 Yesterday I promised to bring you some photos that showed what the Tiffany windows looked like from afar. As you can see, they are really stunning. In this image, I composited my two favorites into a side by side image so that you could get a better idea of what they looked like. 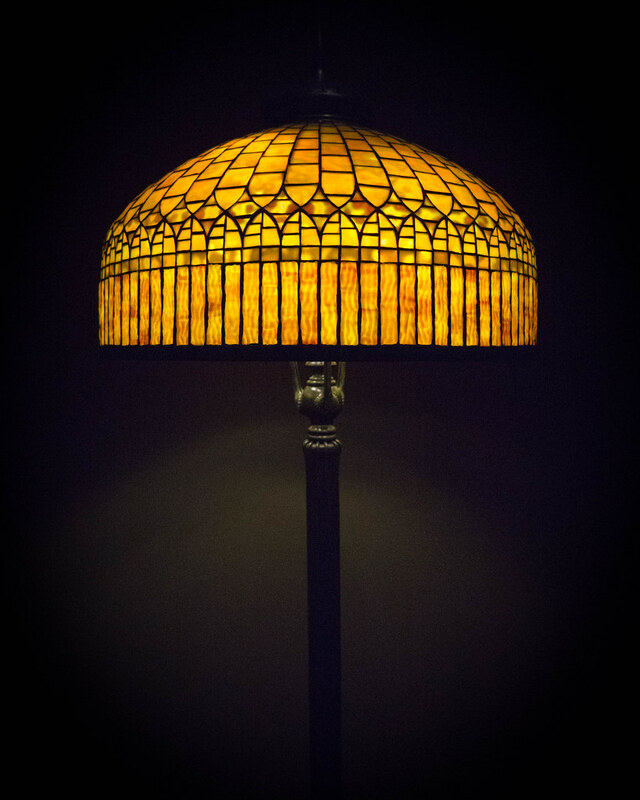 The Tiffany glass artists really lived up to their reputation of being the best in their field. I am not a religious person. However, I really appreciate the art and music that religion has inspired in others. 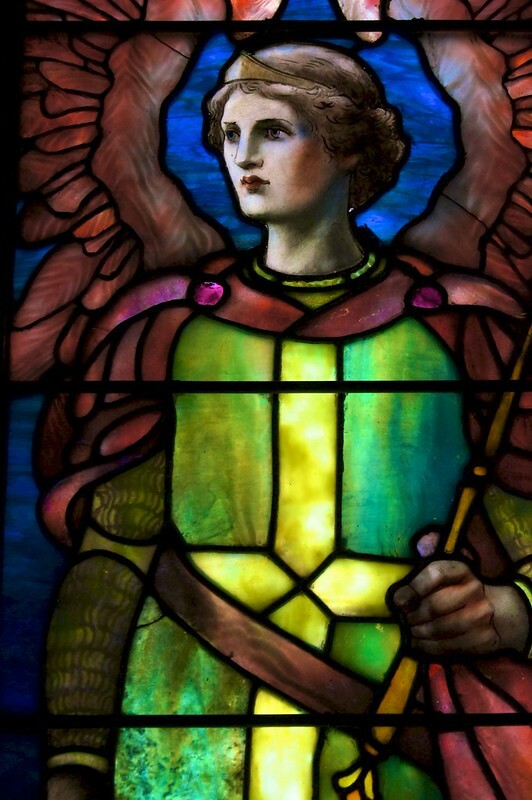 Stained glass windows happen to be a favorite. 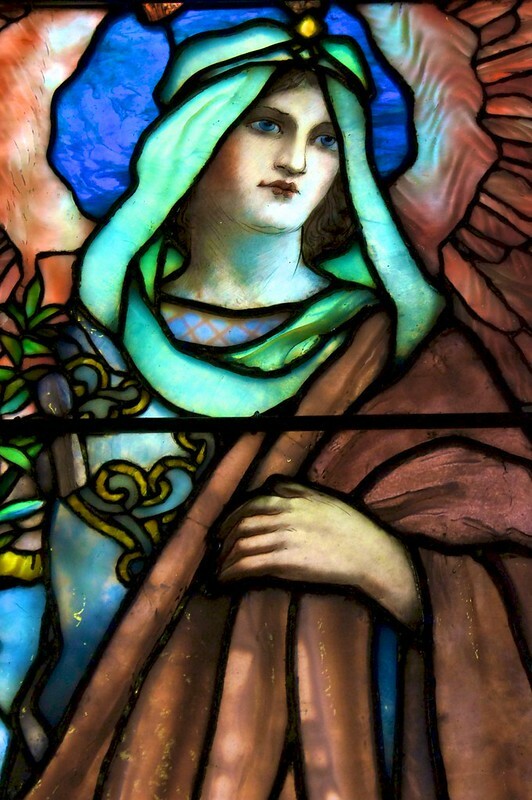 If you have some favorite stained glass windows, share them with us by providing a link in the comments. 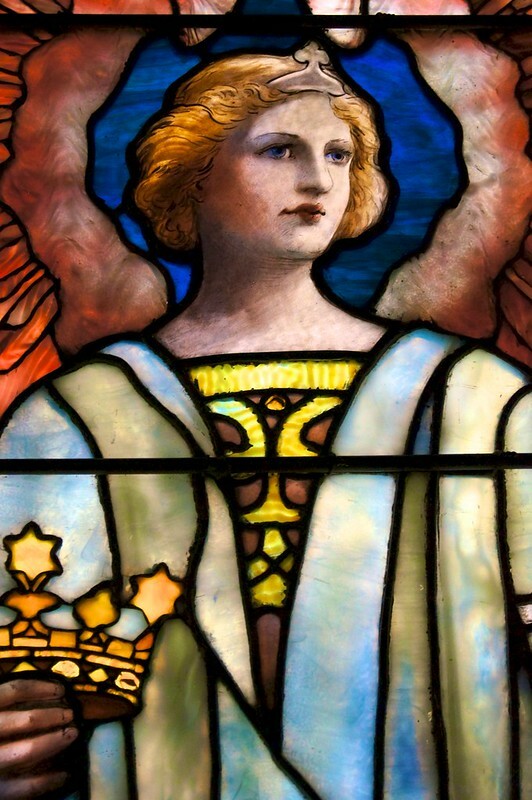 During Sunday's tour of stained glass windows, I had the opportunity to view seven stained glass angels created by Tiffany and Company in 1902. Simply put, they were gorgeous. 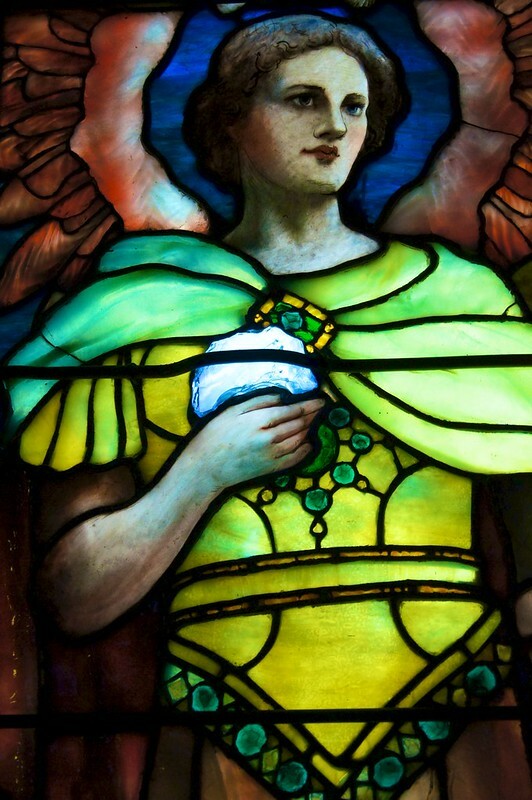 The windows were salvaged from The Church of New Jerusalem, once located in Cincinnati, Ohio. 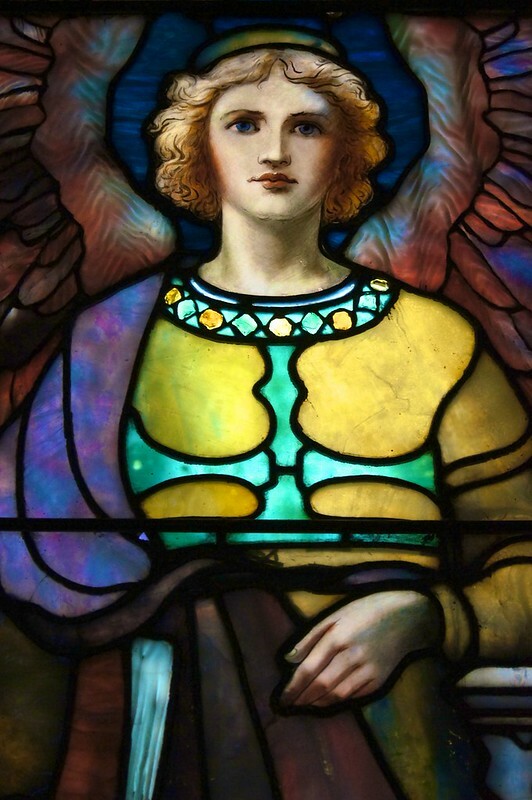 In many places, the windows were crafted with six layers of glass. 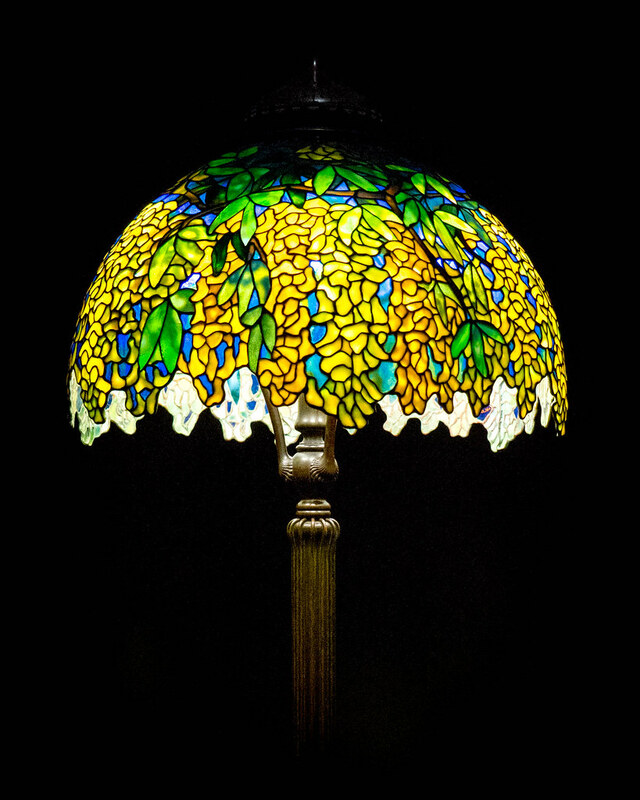 to get the effect that Tiffany was looking for he used his trademark opalescent glass. 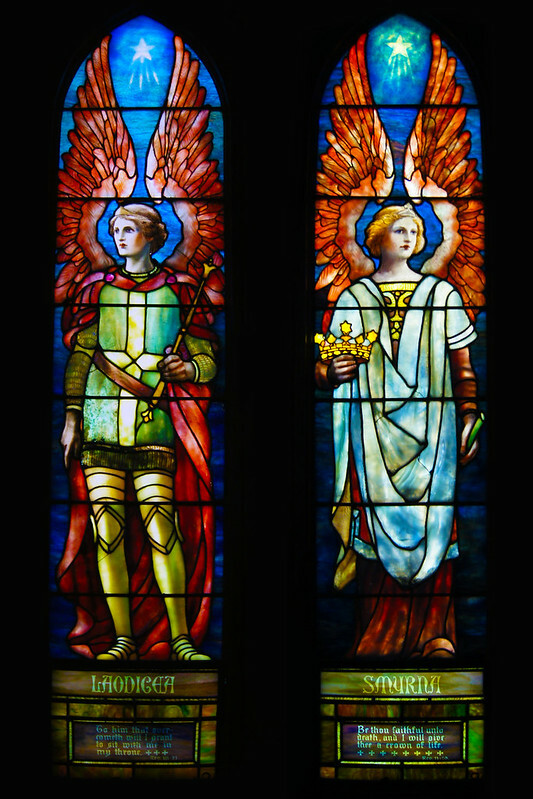 The seven angels represented seven biblical churches. 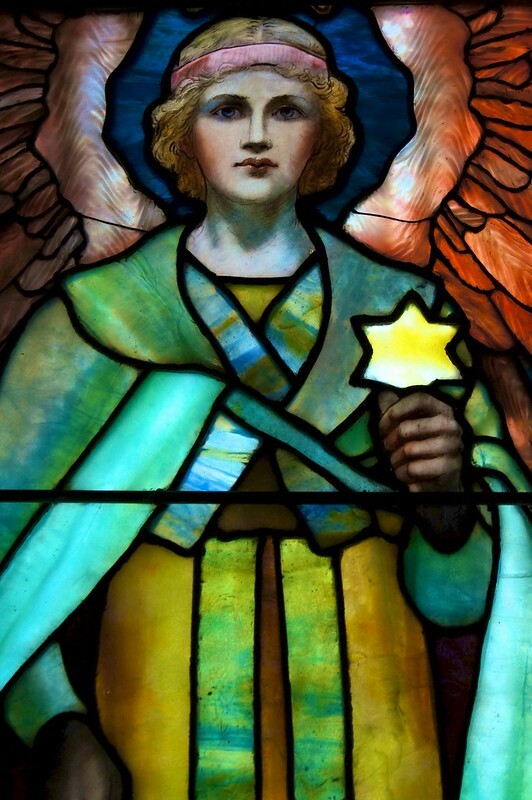 The angels were removed when the state seized the church property by eminent domain, raising the church. The windows then lay crated, sometimes in barns, until they were recently "re-discovered" and restored. The stunning exhibit was located in the library of a small local university. 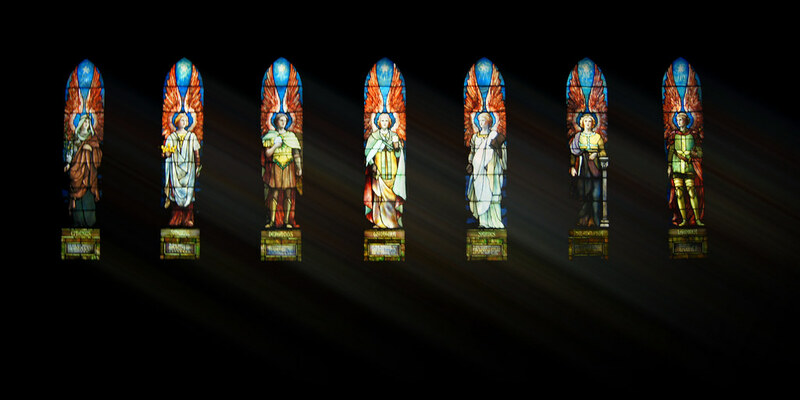 We practically cheered when the librarian agreed to turn the lights off so that we could photograph the windows while they were backlit. Tomorrow, I will treat you to some images taken from a distance to that you can see the eight foot windows in their entirety.